What's better than a Miata? One with a turbo! 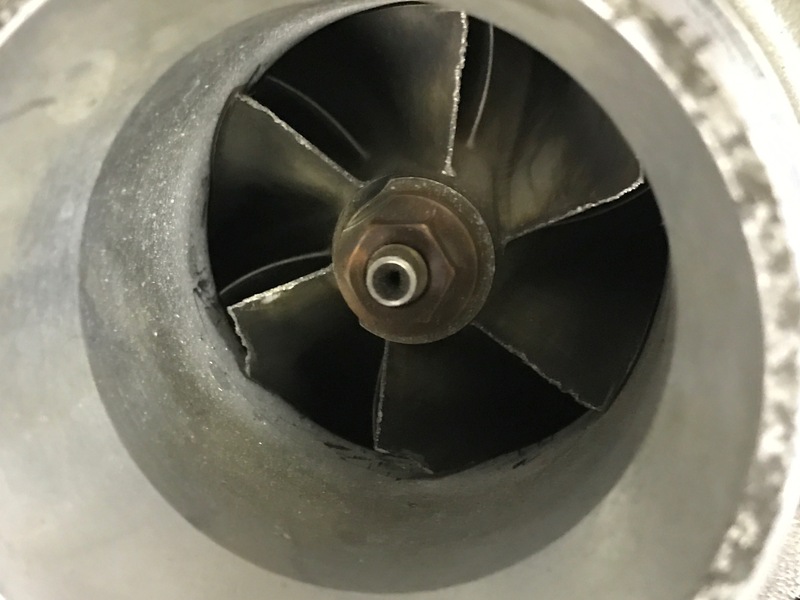 This turbo wasn't worth selling due to this damage on the compressor wheel. We combined our junk turbo with an eBay clone of an outdated Flyin' Miata turbo manifold and a few homemade adapters. We needed more fuel to compliment the boost, so we ordered larger injectors from Fuel Injection Clinic. Need a Miata part? Treasure Coast Miata hasn't failed us yet. They even stock these often-damaged air diverters, which mount behind the front bumper. This was round two for our crapcan Miata, and we weren’t about to return to the track with a car that wasn’t any faster. There was one question, though: How do we make our car faster? We already had springs, shocks, sway bars, bushings, a limited slip, and sticky tires. There was one department we hadn’t addressed, though: The engine. We were thinking about more horsepower last time we were at Very Cool Parts, which will build just about anything that has wheels and goes fast, but specializes in Factory 5 kit cars like the Subaru-powered 818. Owner Wayne Presley had a bin in the corner of the shop labeled “Damaged WRX turbos. Do not sell.” Just like that, we’d decided to use a slightly-damaged turbocharger from WRX to rocket our Miata to LeMons glory–or to a spectacular failure. We’ll cross that bridge once we come to it. Look for a full story, including a tutorial on modifying your own WRX turbo for installation on your Miata, in the pages of Grassroots Motorsports and on our app soon, but to make a long story short we made 193 horsepower at the wheels on a Mustang dyno. That’s from just over $1000 worth of parts, with most of that being a DIYAutoTune plug-and-play standalone ECU and new fuel injectors from Fuel Injector Clinic. Shoutout to Treasure Coast Miata too, as they helped us track down some tricky-to-find new and used parts we needed along the way. Isn’t this all considered cheating in the 24 Hours of LeMons? Debatable, as long as there are journalists on either side of the debate. We’re expecting penalty laps, but we don’t think they’re going to make our 193-horsepower Miata any less fun to drive. Next go around do the BP swap and visit Carlos and the gang at BP Performance Specialty (in Florida as well) about some of their GRM friendly parts that will play nice with your setup. They have modified EVO intakes to help flow more on the cold side, hacked tunable EVO ecus (though you have that covered) and possibly most beneficial, Toyota coil on plug conversions to assist the ignition at higher RPM and under load. cars with heads from a 99 and the exhaust cam swap are seeing 160HP N/A at the wheels, with boost after fueling, rods become the point of concern, though there are options to resolve that concern for roughly $200, though that entails taking on a much larger project that always ends up costing more as you start checking off boxes (boundary engineering billet oil pump, bearings, machine shop cost etc. for example). Now you have me wanting to get another miata to BP swap to build a pair of BP powered monsters that happen to power different axles. 20G billet wheels are a cheap easy upgrade if targeting north of 230HP in a BP. Problem is I want a v8 too. The girlfriend's FB is getting the miata's drivetrain. I forget is the BP the 1.8? I just want more out of my 1.6. I may even do a bare bones fuel pressure regulator, manifold, downpipe just to get a little more while saving up for everything else. I'm really not looking forward to doing an ecu swap. My short term plan was to put a header and exhaust on my 1.6 miata. Long term plan was to do the monster 5.0. But some dude us trying to talk me into buying his 1.8 engine and turboing it or supercharging it. So now im all mixed up.